Here in Maine we are still waiting for spring weather to take away the snow so until then the only gardening I can do is paper gardening. Today from my paper garden I have a card I created for you using more of Susan’s Garden Notes new releases. This card has the new Garden Notes Heart Grapevine Wreath, Ranunculus and Calla Lily. Step 1 From green cardstock cut 2 Garden Notes Leafy Berry Branch. Using Distress Ink shade. Using Molding Pad and Medium Ball Tool from All Metal 4 pc. Tool Kit shape leaves. Using Nuvo Crystal Drops add berries set aside to dry. When dry add berries to back side let dry. Step 2 Form 6″x6″ card base using large embossing folder emboss card front only. Step 3 Cut 2-4 Garden Notes Heart Grapevine Wreaths from brown cardstock. (I used 4 on this card) Stack wreaths using Kids Choice Glue sparingly so as not to glue twigs together just center, Use fingers or tweezers to lift ends of twigs to give dimension. Step 4 Find heart shape that fits center ECD Stitched Hearts used her but you could probably use the center that cuts out of the wreath if you cut 1 from white cardstock and use distress inks to make a background. Step 5 Using black ink stamp sentiment on right half of heart then using Clear Double Sided Adhesive adhere to center of card front. Step 6 Using Kids Choice Glue adhere heart wreath over background heart. Step 7 Cut set of Garden Notes Ladder Fern from green cardstock shade with Distress Ink then pinch up on fronds to give dimension. Step 8 Cut 1 Garden Notes Ranunculus and 2 Calla Lilies from white 90# Soft Finish Cardstock. Color, shape and assemble flowers. Step 9 Using Kids Choice Glue build arrangement on wreath starting with berry branches and ferns then adding flowers and leaves. Hope you have enjoyed my tutorial today and you are inspired to create your own. 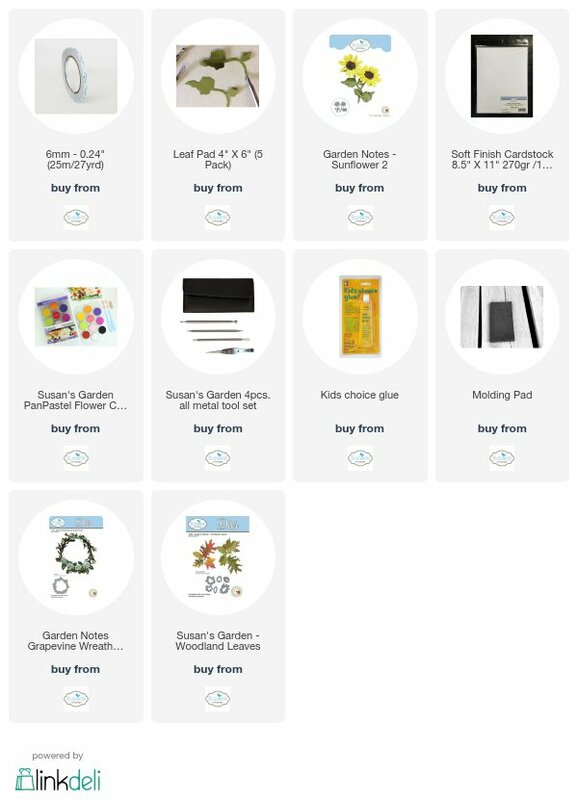 All the Elizabeth Craft Designs supplies used are linked below all you have to do is click on the picture and it will take you directly to their site. Welcome My Crafty Friends! Spring has arrived finally and I believe we are all happy about that at least I know I am. Sadly we are all touched by “Cancer” at some point in our lives some more than others. I know my family and friends have been touched many times. Today my card is for a friend that has just recently been diagnosed with breast cancer. Step 1 Cut 2 Garden Notes Berry Branch from brown cardstock. Using pink Nuvou crystal drops make berries on branches. Do 1 side let dry then do back side and let dry. I do both sides like Susan does but it is optional. Step 2 Form 6″ X 6″ card base from white cardstock. Emboss card front with embossing folder of your choice. Step 3 From white Soft Finish Cardstock cut 3 Garden Notes Round Grapevine Wreaths. Using Kids Choice Glue just dab around center area on back of wreath (no glue on the little branches) attach 1 wreath at a time to card front giving each wreath a quarter turn to off set each wreath. Once dry pull up on some of the branches to give it fullness. Step 4 Using Garden Notes Lilac 2 and 85# white Soft Finish Cardstock color front and back of a piece large enough to cut flower plates 2-3 times each. Just kind of scribble you want little areas of white and varying shades. Shape and build your lilacs Here is Susan’s video for making lilacs. Step 5 Cut 3 pink tulips and 2 white tulips using Garden Notes Tulip 2 die set. Shape and build tulips. Susan’s video below for making tulips. Step 6 From green cardstock cut 1 set of Garden Notes Ladder Fern. Step 7 Using Suzanne Cannon’s Courage die to cut from white Soft Finish Cardstock that has Clear Double Sided Adhesive on top twice and once from cardstock with adhesive on top and bottom (this will be the bottom of the stack). Cut once from pink glitter cardstock. Cut ribbon from Suzanne Cannon’s Hope die set 3 times from white Soft Finish Cardstock with Clear Double Sided Adhesive on top then once from pink glitter cardstck. Stack together. You are making 3 pink ribbons and 1 Courage. Step 8 Assemble using Kids Choice Glue starting with ferns. Ferns, berries, lilacs, tulips then leaves. Add courage to bottom under wreath and use pop dots to add ribbons. Hope you have enjoyed my tutorial today. 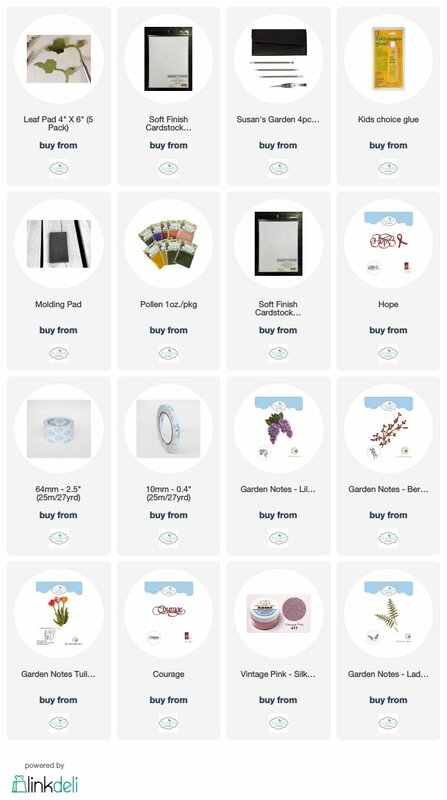 By clicking on any of the product pictures below it will take you directly to Elizabeth Craft Designs site. Hello everyone welcome to my blog and thank you for stopping by. Today is Susan’s Garden September Challenge and the challenge this month is Home Decor using Susan’s dies. I chose to decorate a lantern that I have had around for a while and have not been using. Sorry about photo quality as it is very hard to photograph things with glass. For our Challenge today Elizabeth Craft Designs are giving away a $20 Gift Card to use on the Elizabeth Craft Designs website to 3 winners. To enter, simply leave a comment on the Elizabeth Craft Designs blog post and answer this question: What Home Decor items do you like to create to use in your home? The winners will be announced on Friday, September 15th, on the Elizabeth Craft Designs blog. 1. Cut 7 or 8 Garden Notes Grapevine Wreath from medium brown color cardstock. Shade each one using inks or PanPastels (Distress Oxide re-inkers used here) Lay each one face down on molding mat using medium ball tool from Susan’s 4 pc. Tool Kit rub branches all around then turn over and rub branches here and there with ball tool this gives some dimension. Using small amounts of Kids Choice Glue attach wreaths together stacking them as you go. 2. Make 5-7 Sunflowers in colors of your choice using Garden Notes Sunflower 2 die. Susan has a video on Facebook – Susan’s Garden Club page showing how to do her sunflowers and the Woodland Leaves. 3. For leaves use White Soft Finish Cardstock colored with PanPastels Set 1 rubbing colors all over paper then cut leaves from paper. You could also cut from colored cardstock and shade with PanPastels Set 1. Cut a variety of leaves so you would have enough to go all around the wreath. Lay leaves on leaf mat and using leaf tool from tool kit put vein lines in. Center line is done on back then turn over and put side veins in. place wreaths inside lantern. Cut a large clear plastic cup so you have approx 2″ ring. Attach Sunflowers to plastic ring using Kids Choice Glue. Add a little glue to just top back of sunflower press up against plastic ring evenly spacing sunflowers all around. Add the sunflower leaves. Place ring into lantern setting inside center of wreaths. Add Woodland leaves randomly all around attaching with a little Kids Choice Glue. (if you don’t attach and just lay leaves in it would be very easy to change for the seasons). I do hope that this has been inspirational and gives you some ideas on repurposing an old lantern. If you don’t have an old lantern I have seen them at places like A.C.Moore, JoAnn’s and Hobby Lobby. Mine is fall but you could do any season or decor that you like. By attaching flowers to plastic ring and not attaching leaves but just laying them in there you can certainly change out for different seasons. I am thinking this would be beautiful with Susan’s Garden Notes Rose 1 and the Ivy Vine. 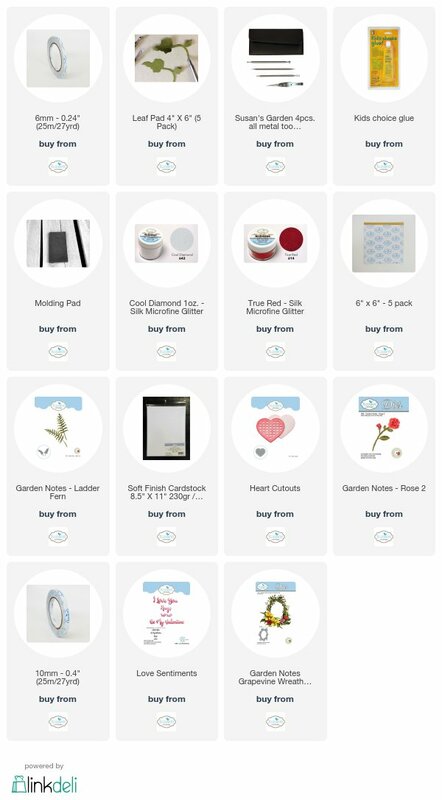 Be sure to visit Elizabeth Craft Designs for all their wonderful dies and supplies. Also be sure to check out their blog for details on this months challenge to see all the Design Teams creations and a chance to win.